It’s very interesting to watch the construction process unfold. There is a lot of hard and very dirty work involved, both with heavy equipment and by hand. 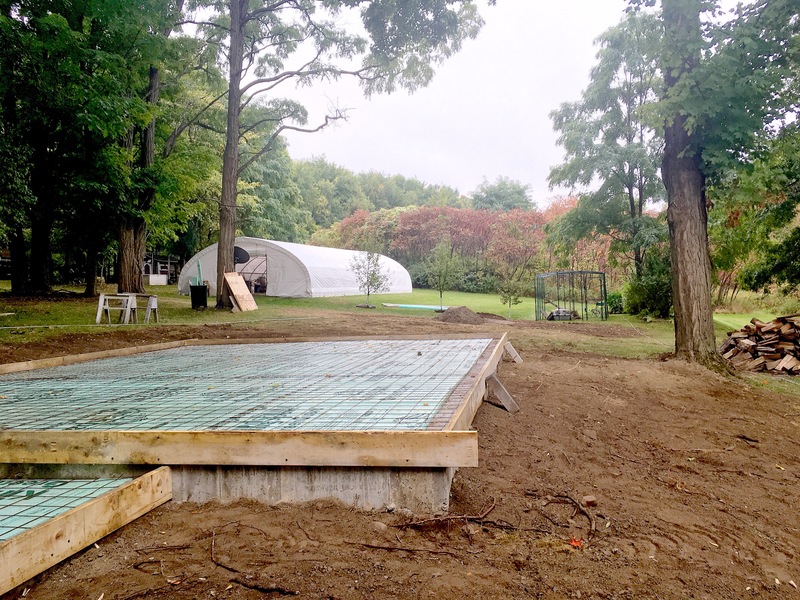 The sunroom base is almost complete, one more final layer of concrete will top it off next week. There is dirt everywhere, and the chickens are the only ones not complaining (they love it). After the second tier of frost wall went up and dried, the wooden form walls were pulled off (a long process in itself, aided by a very smelly oil that was sprayed on the forms prior to keep the dried concrete from adhering to them). Dirt was backfilled in around the walls and on top, leveled out by a day-long session with a compactor. Then new forms went up to shape the top of the slab. Foam insulation boards and wire mesh followed. The wire reinforces and strengthens the concrete, and the foam will keep any tile that finishes off the floor from sweating and creating a slick, hazardous surface to walk on. Problems, like rocks, always turn up, of course. Re-grading the surrounding dirt became one. How to move the water away from the addition when it flows down the hill? Nothing used to be there before to stop it, so it would most likely result in standing and pooling. We talked about installing a French drain, or gutters, and the possible but unwelcome thought of raising the height of the slab. Rick decided the best solution was to create a gravel swale (a ditch, basically) on the uphill side to help draw excess water down into the ground. There is still some grading to be done on the downhill side, too, before all is said and done. I am realizing construction really is creation. It seems very basic at first, building a structure, following a few simple rules using math and physics. But you need to be creative, too. Though it’s not the Sistene Chapel going up, you still have to be able to adapt to changes, to problems, and be able to resolve them with the original vision always in mind. To think about the final result when there is nothing but bare ground staring you in the face. Its a good lesson for me, and helps me appreciate all the work the guys are doing even more.